Do I have scoliosis? This is a question I get asked fairly often when people come in with back pain. 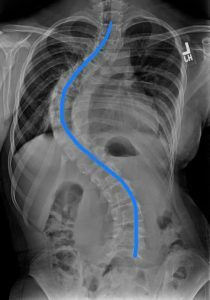 Scoliosis is when you have a curvature and a rotational deformity of your spine. By definition the curvature of the spine should be at least 10°. You can develop it as a child with the etiology (most commonly genetically related) or as an adult secondary to arthritis. Treatment is based on the age of onset and the degree of the curve. It can range from simple observation, bracing, to complex invasive surgery. 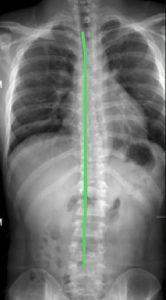 The image with the blue S curve is a patient with scoliosis and the image with the straight green line shows a normal spine.